Most businesses face a sales downfall during the summer months. Families might love summer because it means time off from school and long holidays at the beach. Though, small business owners are less likely to appreciate this time of year. In fact, summer is infamous in the marketing world because it tends to correspond with a serious sales slump. Here are 8 proven marketing strategies that can help you bring in more customers during months with slow business and combat seasonal income fluctuations. Does your product or service have a special use during the summer months? If so, it’s a perfect reason to engage face-to-face with loyal and potential customers with a branded street team. It could be situated in high-traffic areas, giving out samples, and distributing key messaging. If not, there are plenty of summer-related goods you can give away: consider water bottles, coolers, Frisbees, etc., to distribute to your target audience. Think about another business that shares a similar customer base, but does not directly compete with your consumer needs. Build a tactical partnership and put together a customer-pleasing summer sales package. Create a unique offer in which both businesses offer a special promotion while also assuming shared accountability. Summer kicks off a variety of outdoor events—concerts in the park, little league baseball games and endless marathons. Habitually, these events require sponsors to help pull them off, which provides a great prospect. Your business can high point its local involvement with the community and boost customer awareness. Investigate local sponsorship prospects and heighten your brand perception with signage to advertise your company name and brand. Outdoor events generally include booths where you can distribute brochures, flyers, business cards, product giveaways, etc. It’s summer — individuals are out and about. For retail productions, hosting a sidewalk sale is pretty much a no-brainer. Display your merchandise and provide helpful information about your services. Also, consider integrating seating and refreshments, so spectators feel encouraged to engage and relax. Keep your target audience top of mind, for example, balloons and games always attract kids. On summer occasions like Memorial Day and the Fourth of July on everyone’s calendar, consider offering a special military discount to veterans and their families. Inspire followers on your social media networks to talk about the meaning of these holidays and recognize the sacrifices military personnel make for our country. It will help humanize your brand, associated with your audience and instill goodwill. If the pace of business slows slightly during the summer, take the opportunity to treat your best customers to lunch. This provides precious face time to people who mean the most to your business. When business is brisk and there are orders to fill, it’s easy to delay social media activity until you have some breathing room. Though, your clients haven’t stopped posting photos on Facebook, uploading vacation videos on YouTube, and sharing tidbits about adventure travel on Twitter. Think about holding a social media contest, inviting customers to share exciting stories or intriguing photographs around a summer theme, and offer a “grand prize” to the best entry. You’ll get individuals talking about your business in the process, while also collecting contact information from contest participants. Be sure to classify prospective customers who you can reach out to at a later time. Don’t let the thrust of summer marketing campaigns fade away in the fall and winter. If you’ve been conscientiously adding new names to your customer database, continue reaching out with newsletters, special offers, promotional discounts and other activities. This way your small business stays fixed in the mind of your target audience year round. Your clients don’t disappear during the off-season. 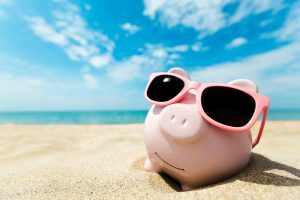 Summer sales figures might be historically low, but that doesn’t mean your small business profits have to suffer as well. Follow the above marketing strategies to keep your sales numbers up no matter how high the mercury soars. 12 Different Types of Debt and Debt Recovery Options Are Your Payroll Problems Really Cash Flow Problems?